Last weekend, as I made the very inaccurate prediction that Steven Spielberg was going to take home another “Best Director” Oscar for Lincoln, I suddenly started thinking about his extensive body of work and asked myself an interesting question: has Steven Spielberg ever made an underrated gem? It goes without saying that he’s made some of the most successful, iconic movies of all time, but even on the rare occasions when he directed a film which flopped or was unsuccessful, said films didn’t exactly sink into obscurity. However, when you at the director’s filmography, there’s one title which makes even the biggest Spielberg fan ask: “What the hell is that anyway?”. In 1971, Spielberg directed his first film when he helmed the made-for-television thriller, Duel, the tense story of a driver being relentlessly pursued by a mysterious tanker trunk. Needless to say, Duel surpassed expectations so much that it eventually garnered a theatrical release and showed the world that this Spielberg kid had immense potential as a director. Spielberg spent the next few years directing some other forgettable made-for-TV movies for Universal and a couple of TV episodes before finally striking it big with Jaws in 1975. However, in between Duel and Jaws, Spielberg also directed his first theatrical film, a comedy-thriller called The Sugarland Express. The film drew some critical praise, but only received a limited release and did rather poorly at the box office. It’s possible that this film might be completely forgotten about today if the director hadn’t become such a household name. 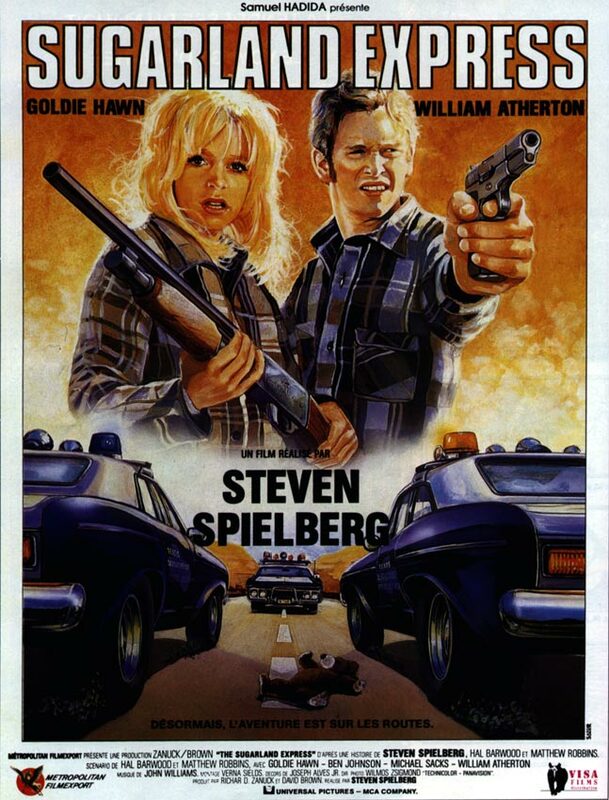 However, The Sugarland Express is a very solid film which still holds up really well nearly 40 years later and it would probably be a standout piece of work in the filmography of any director not named Steven Spielberg. At the beginning of The Sugarland Express, a young woman named Lou Ann Poplin (Goldie Hawn) is visiting her husband Clovis (William Atherton) at a minimum-security prison farm in rural Texas. Lou Ann has recently been released from prison herself and discovered that the couple’s infant son, Langston, was taken away by the state and given to a foster family in the town of Sugarland. Lou Ann devises an escape plan which involves smuggling clothes into the prison and making Clovis wear them, so that he can pass himself off as a visitor and walk out the front gate with his wife. Of course, this escape makes no logical sense since Clovis only has four months left on his sentence, but Lou Ann desperately wants to reclaim their son and Clovis is not about to disobey his wife. Through a comedy of errors, the couple wind up commandeering the vehicle of a rookie patrolman named Maxwell Slide (Michael Sacks) and they decide to take him along as a hostage. Once word of this gets out, all hell breaks loose and a large caravan of police officers and reporters wind up pursuing the couple and their hostage as they make the long trek to Sugarland. After the whole thing becomes a media circus and the public finds out that Lou Ann and Clovis are doing this to get their son back, the couple garner a lot of sympathy and support. Captain Tanner (Ben Johnson), the veteran policemen in charge of catching them, knows that Lou Ann and Clovis are non-violent criminals who have only served time for crimes such as petty larceny, so he would prefer a peaceful solution to this situation. However, the chase also attracts the attention of a lot of trigger-happy cops and vigilantes who have no qualms about using bullets as a resolution. As you can in the previous clip, one of the standout moments in this film is a long, unbroken tracking shot where the camera does a 360-degree pan in a moving car while the characters converse on the radio. While The Sugarland Express may not have been a success, it’s moments like this which made critics point out that Steven Spielberg might be a director to look out for. This obviously isn’t a big standout movie in Spielberg’s career, but it does a good job at showcasing the director’s immense skills as a filmmaker and a storyteller. The story was based on a real-life incident where a fugitive couple named Robert and Ila Dent kidnapped a patrolman and commandeered his car, which lead to a giant motorcade of police officers and reporters chasing them down. In fact, J. Kenneth Crone, the real-life patrolman who was kidnapped, even has a cameo in this film. The Sugarland Express has a lot of fun satirizing the media circus this event creates. The movie’s points about sensationalism in the media and the public’s infatuation with turning criminals into celebrities are more relevant today than ever before. The funniest sequence is probably when the fugitives stop to gas up their car while the entire motorcade waits for them. After they’re finished, cops and reporters then simultaneously pounce on the station to fill up their own vehicles while the media tries to interview the bewildered attendant. The Sugarland Express actually has a lot in common with the iconic Dog Day Afternoon, which was released one year later. Both movies were based on real-life incidents where amateur criminals got themselves involved in a hostage situation which briefly turned them into beloved celebrities, but their 15 minutes of fame quickly expired once the situation was resolved. There are times when the chase in The Sugarland Express resembles a Road Runner/Wile E. Coyote cartoon and Spielberg none-too-subtly makes this analogy in a scene where Lou Ann and Clovis stop to watch one of those cartoons at a drive-in. Goldie Hawn is pitch-perfect as the self-absorbed Lou Ann, a woman who greatly enjoys all her newfound attention and celebrity, but only lives in the moment and has little regard for the consequences of her actions. It’s obvious there’s no way the couple could ever hope to get away with this and get Baby Langston back, but you can actually believe that Lou Ann would be oblivious to this. William Atherton is best known for his role as Walter Peck in Ghostbusters and was a go-to guy for playing assholes in movies during the 1980s, but he does a very solid job playing a more innocent, good-hearted character here. You can sense that Clovis knows he’s in a hopeless no-win situation, but just doesn’t have the heart to tell his wife. The two leads also receive solid support from the Ben Johnson and Michael Sacks, who both empathize with the couple and just the whole thing to end peacefully. The Sugarland Express also marks the very first collaboration between Spielberg and John Williams, who provides a very effective score which is a lot more low-key than you’re used to hearing from him. In addition to the media, the film does not hesitate to satirize the trigger-happy nature of Texas’ gun culture. Even though it’s apparent that Lou Ann and Clovis would never shoot anyone, several people think that the only solution is to pump bullets into the fugitives and it even gets to the point where the safety of the hostage isn’t a priority. This all leads to what is an atypically downbeat ending for a Steven Spielberg film. The director was apparently against this and since audiences didn’t respond well to the ending here, virtually none of Spielberg’s films since then have ended on a down note. In the end, The Sugarland Express remains a unique anomaly on the filmography of Steven Spielberg. Watching it, you’d probably never guess it was a Spielberg film and while it has been greatly overshadowed by the director’s other work, it is very well done and definitely worth checking out.